We are proud to release our new 6000 mode modded controllers xbox one! 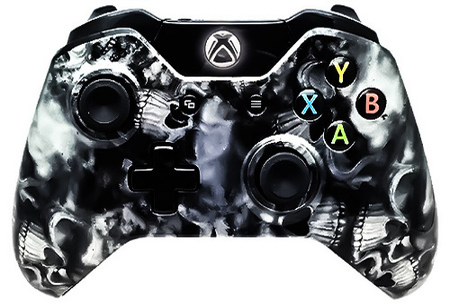 we offer most mods ever on a xbox one controller more than on any other modded controller anywhere! So you can dominate your call of duty opponents online! Guaranteed! Use up to 6 feature mods at once! Our Rapid Fire is the absolute best in the business. It comes standard on every xbox modded controller. This features fully programmable Modes that can be set to any speed you'd like. Just turn on your controller and start killing! It's also set to preset speeds for the most popular games so that your controller is ready to use the moment you take it out of the box. To use Dual Rapid Fire scroll to mode 1 of your controller. Dual Rapid Fire will make dual weapons both shoot with rapid ﬁre when the left and right triggers are pulled. JumpShot will make your player jump off the ground as soon as you pull the right trigger. The longer you hold the trigger, the higher he will jump. This comes in handy in many games other than Call of Duty. Because of the way this feature is designed, it fits in with almost any playing style. Multiple trigger presses allows you to control the height that your player jumps. Jitter Fire allows your weapons that fire in a burst pattern to fire as a fully automatic machine gun. This feature comes in handy when you are in need of heavy hip firing tactics. Most burst fire guns are strong but are severely limited by there fire speed due to the pause. Jitter Fire will remove that pause and allow you to unload on your opponents. Quick Aim will aim your weapon automatically as soon as you pull the trigger to fire your weapon. With this feature you'll no longer need to pull the left trigger to aim when you are in battle. We've found that the small difference in timing has a huge affect on your Kill to Death ratio. You won't want to play without this feature ever again. Auto Burst works similar to the burst fire feature but takes it a step further. Auto Burst will continually burst fire your rapid fire weapon. It will turn any weapon into a weapon that fires in bursts. This will save ammunition throughout the course of your game and also increases accuracy of most weapons. It also times well with rapid fire weapons so that they have the perfect number of shots without shooting to many to get the kill. This feature comes standard with our all mod controllers. Easy Sprint will allow you to sprint without pushing the left joystick in every time you want to sprint. With Easy Sprint, all you'll need to do to sprint is lightly tap the left trigger without ever removing any fingers from there position on the controller. This is the most natural feeling way to sprint. You will never turn this feature off! Quick Reload will shorten the length of your reload times when you use the X button to reload. By taking advantage of an animation difference in the game, your controller will give you the ability to reload your guns at perk level speed. We have also developed this feature better than any other company. You can set Quick Reload by simply reloading your gun each time instead of pausing the game, entering multiple programming modes and then saving like our competitors. Your controller handles all of that at real time while you are mid game. Auto Spot will automatically place spot markers on enemies within aim when the left trigger is pulled in all Battlefield games that use spot marking. You'll never need to spot a player again. Turn Auto Spot on and play as you normally would. Forget about needing to mark enemies forever! Your controller will take care of every spot mark needed. Active Reload will perfectly time your active reloads when the right bumper button is used to reload. For Gears of War players, you will soon be asking your self how you ever played without this feature. With our mod controllers, you will never miss an active reload again. It's as simple as that. We developed this feature very similar to our Quick Reload feature so that it all happens in real time during your game. When DropShot is on your player will automatically drop to the ground as soon as you start to fire and automatically stand back up when you stop. Our tests have shown that on average you'll avoid 65% of your enemies shots with this feature alone. On top of that, we've added an additional function that will save you kills. When you are holding the left trigger, your player will not drop to the ground. This allows you to complete a kill without falling to the ground and taking your aim off your target. Mimic mode takes our already state of the art Dual Rapid Fire feature and makes it better. With Dual Rapid Fire, you still have to pull both triggers taking your focus off the game for a split second. With Mimic you'll only need to pull the right trigger and both of your guns will rapid fire. We've found this feature to be a huge benefit during close range battle. This feature is another one of our fully adjustable features that make our controllers who they are. With Adjustable QuickScope, you can set your QuickScope timing for any sniper rifle. Try doing that with another Modded Controller. Then, as soon as you pull the left trigger to aim, your controller will automatically aim and fire with perfect timing. Auto Aim Zombies all make your aim automatically snap onto the closest enemy and stay locked on. Try it out early in a Call of Duty Zombies games. As soon as you start aiming your gun will follow the zombie as he walks. *This Mode only works for Call of Duty Zombies. Sniper Breath is essential for any sniper player. When you are in Sniper Breath Mode your player will automatically hold his breath for you as soon as you start aiming. This puts your focus 100% on getting the kill. Plus if you have to go in and out of aiming quickly, it does the work for you! To reset the mode you are in to it’s default settings, hold the right trigger and tap “up” on the D-Pad. To increase or decrease the speed of any mode, hold the right trigger and tap "up" or “down” on the D Pad. You can change modes by going up a mode or by going down a mode. To go up one mode, hold the Mod button and tap “up” on the D Pad. To go down one mode, hold the Mod button and tap “down” on the D Pad. To reset your controller back to it’s factory settings, hold the left trigger and tap “up” on the D Pad. Your controller will automatically save every setting as you do it. You can remove the battery pack at any time and your settings will always be saved. Your controller will remember the last mode you were in when you shut off your controller. When you turn your controller on, it will automatically enter that mode. *The modded combinations and features of our xbox one controllers allow for thousands of easy to use settings. They work around patches and updates so you will not have to worry about buying new controller in the future! Its Future proof!